Fortnite has made Epic Games a lot of money. Like, a lot of money. So much so that the studio's CEO, Tim Sweeney, is now on the Bloomberg Billionaire's Index as one of the 200 wealthiest people in the world. Suffice to say, Epic can afford to be generous with the 80 million odd players who have provided the company with such untold riches. So, in the spirit of Valentine's Day, the developer of the free to play battle royale game has announced in the 7.40 Patch Notes that it'll be giving away the Fortnite Season 8 Battle Pass to anyone who completes 13 new Overtime Challenges" in the game before February 27. 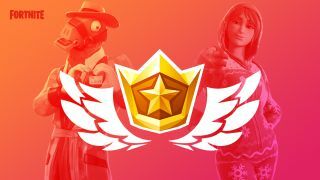 The 20 Overtime Challenges, the first six of which are now live in the game, are available to any Fortnite player, regardless of whether you own the Fortnite Season 7 Battle Pass or not, and includes tasks such as "Collect Coins in Featured Creative Islands" or "Place Top 15 in Duos with a Friend." In the Patch Notes, Epic also revealed that Gifting is back for a limited time (with the chance to gift and receive a free, Valentine's themed "Heartspan" Glider), the Infantry Rifle weapon is now available in the game, and a new LTE Mode - Catch! - has landed, in which grenades and throwable items are the only tools available. Additionally, the patch notes promise that players can "unlock 5 new rewards including the Valentine Wrap and Vines Contrail for completing these [Overtime] Challenges", though several of them are still locked off until a later date. This is the first time that Epic Games has given away a Fortnite Battle Pass, which usually costs 950 V-Bucks in in-game currency, but it looks like the studio wants to give back to the audience that catapulted it to worldwide fame in less than a year. So hop in before February 27, and start working Overtime to get that coveted Battle Pass before Season 8 begins! For more free Fortnite stuff, here's how to get free Fortnite V-Bucks without getting scammed.